With more than 100 types of arthritis, an individual may face the threats of osteoarthritis, debilitating rheumatoid arthritis, or gout in the course of their life. An array of body parts can be affected by the symptoms of arthritis, which roughly translates into joint inflammation. Arthritis brings pain, swelling, and stiffness that, over time, can lead to tissue damage. Some arthritis cases promote continuous health problems, while many individuals face recurring bouts. bones is a spongy material called cartilage, which provides cushioning for the bones, as well as permits joints to move without pain. A thin film of tissue called the synovium lines joints with the help of a slick fluid that assists the reduction of friction. An assortment of additional body parts help to stabilize joints, such as ligaments, muscles, and tendons. When arthritis strikes, the region in or about the joint becomes inflamed, which then leads to pain, stiffness, and sometimes the inability to move. Arthritis may also affect the skin and internal organs. While there are many different kinds of arthritis, some types are more common to strike than others. For instance, osteoarthritis is one of the most frequently seen types of arthritis. With this condition, the cartilage covering the end of the bones fades away. Without the protection of cartilage, bones start to rub against one another. The friction develops pain and swelling. Osteoarthritis is mostly seen in the hands, knees, hip, and spine, but can attack any joint. The condition, which is sometimes referred to as degenerative joint disease, usually appears with age, as more and more cartilage begins to break down. Rheumatoid arthritis affects any joint in the body, but is most commonly appears in the hands, wrists, and knees. Patients suffering from this type of arthritis are plagued with the long-lasting effects of the disease, which also causes problems with the immune system. As the body’s defenses attacks itself, joint linings swell, causing inflammation that may spread to surrounding tissues. Damage to the cartilage and bones are inevitable. In the most extreme cases of rheumatoid arthritis, patients may feel the effects in their eyes, on their skin, and with their nerves. When the body cannot excrete uric acid, gout is the result. The excessive substance within a patient’s body forms “needle-like crystals” in the joints, causing intense pain and swelling. With this form of arthritis, the wrist joints, knee, and big toe are the most affected parts of the body. Arthritis is a rather common ailment across the world that may affect as many as 70 million individuals in the United States. It is estimated that close to one in three people have some kind of joint pain or arthritis. The most common form, osteoarthritis is believed to affect more than 20 million Americans. Although the condition is more common in older adults, it may strike all age groups. 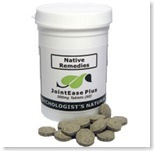 You may want to consider Natural Cures for Arthritis that are safe and effective. Alternative Remedies for Arthritis are becoming more widely used as our society continues to look for holistic treatment for common ailments. Not only safe, NaturalHerbal Joint Treatment works.